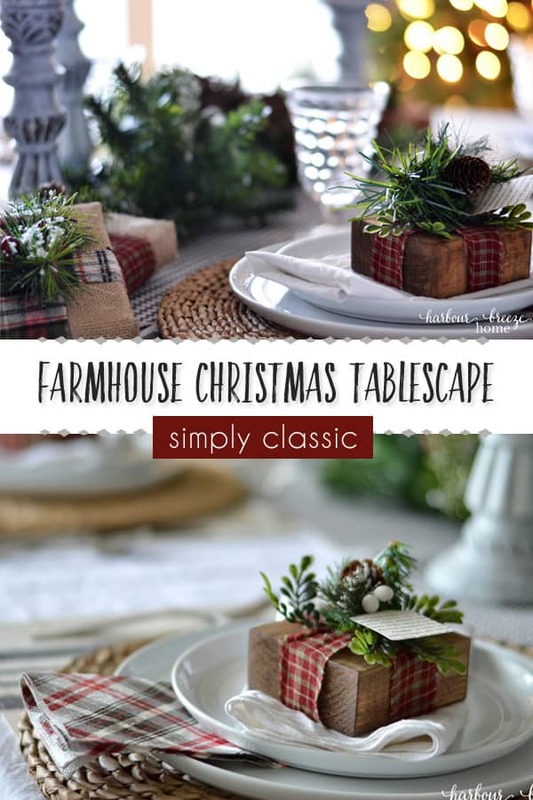 In this article: Find ideas and elements to put together to a simply classic Christmas farmhouse tablescape. I’ll be honest. Sometimes I really just want to buy all the things when I find something I love. Such was the case as I wandered through a store a while ago. I strolled past displays of sparkly gold and fluffy white Christmas decor. I glanced at a colorful and whimsical vinyettes of aqua blue and red with old fashioned fonts and signs that made me smile. I gasped and started collecting things for my cart. In went 5 napkin rings, 5 little plates, the napkins, and the runner. Visions of the the cutest table ever were dancing through my head. And then, I started adding the total $ up. Glory be!! Back on the shelves it went. Instead, I came home and tried to create a similar look with things I already had. Like I’ve learned before, the lovely limitation of finances seems to highten creativity. 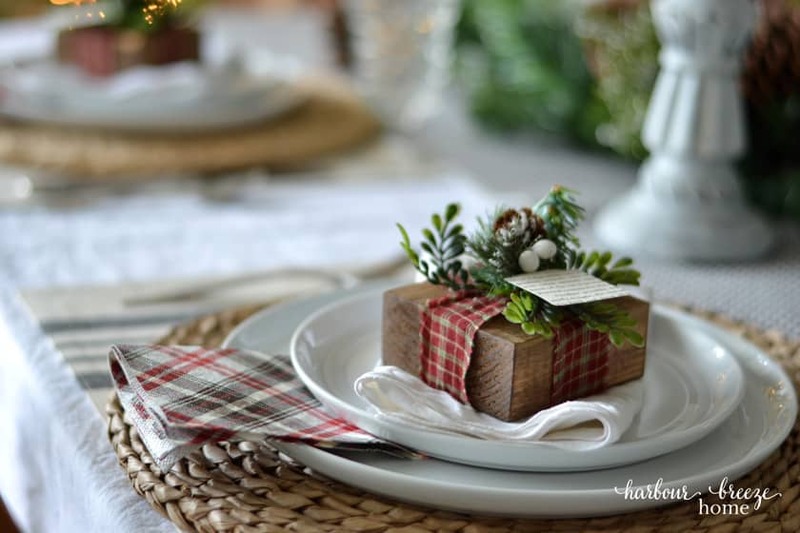 It becomes a challenge I love, and in the process, it’s a delight to discover I don’t need more things (that require more storage space) to get our home ready for the holidays! The round wicker chargers under the plates add a nice texture and layer to the whole look. 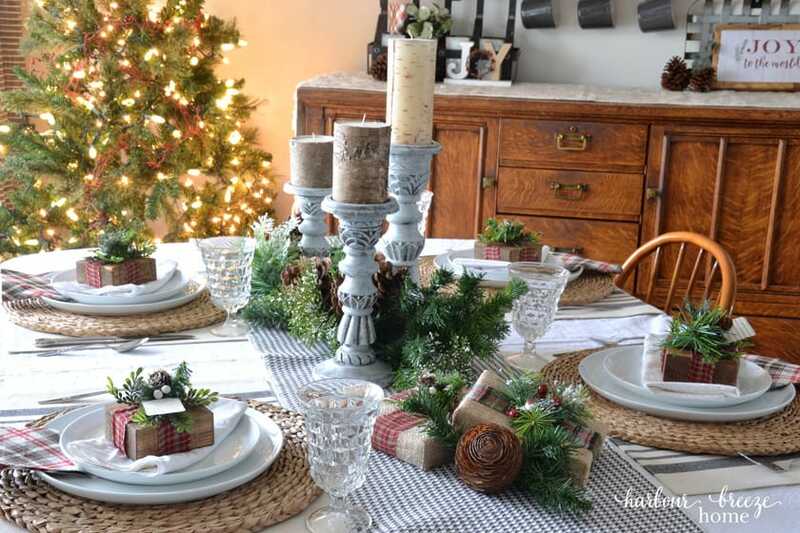 Although I sometimes like to build my table settings around my Mom’s china dishes, I find the farmhouse look works best with simple white dishes. These were my Christmas gift from my husband a few years ago, and I love them. One thing I’ve learned from studying other tablescapes is that a pretty looking table often has lots of layers. Tuck in napkins and bring out the salad plates ( and even little bowls for another layer), and as you add them together, they create a nice, full look. 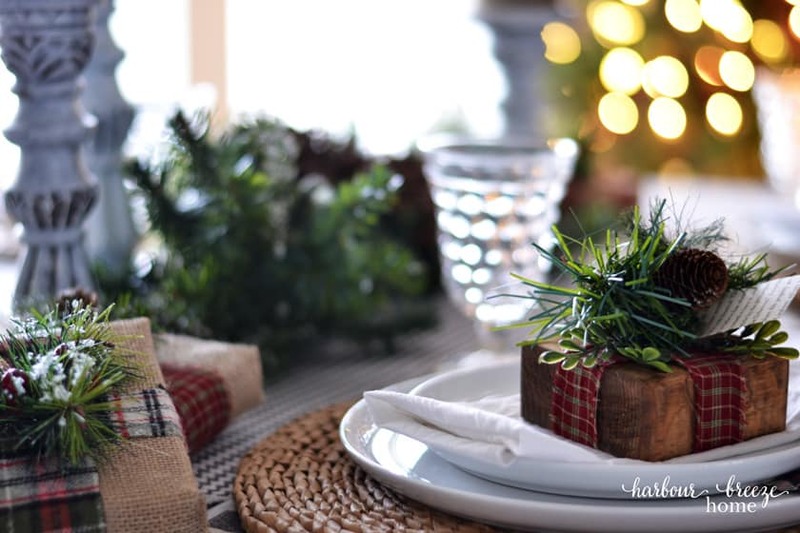 For this simple center piece, I staggered candle holders (of different heights), faux greenery, pine cones, and the burlap gifts I made a few weeks ago. This wooden gift placecard holder was a super simple craft project ~ that used up left over 2 x 4s from the garage. 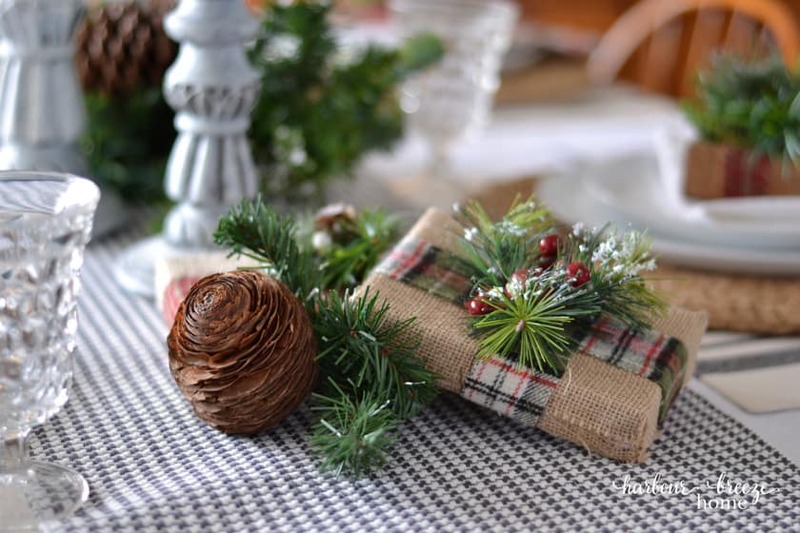 When they aren’t sitting on the table as place card holders, they perch on my farmhouse shelves in the Dining Room.